Much like the way you should look at the labels of the foods you buy, you should check the labels of your health, cosmetic and personal care products. The FDA regulation of these products is even looser than than the weak regulations they have on food. These companies can essentially use any ingredient or raw material without government review or approval. Something that seems insane to me! Under a law that has not been updated since 1938, the U.S. Food and Drug Administration (FDA) has little power to regulate the ingredients in personal care products. Even known offenders such as formaldehyde, triclosan, and phthalates are still legally permissible in product formulations. Companies are allowed to label their products organic, natural, or hospital-approved based on their own interpretation of the terms. They can even hide problematic ingredients in proprietary formulations by listing them as “fragrance” on a label. While a lot of us can see the problem here, some may wonder why this is a big deal. If it saves you money, why not right? Wrong. First off, your skin is the outer covering of your entire body. It is the largest organ of the integumentary system and it absorbs a lot of the substances that get put onto it. This is why topical ointments and creams have been used in medicinal practices for thousands of years. Due to the fact that skin acts as a sort of sponge, you can see how it will also absorb the chemicals present in these beauty and personal care products. Many of which are skin irritants, skin penetrators, endocrine disrupters and even carcinogenic. While I can't go over every harmful ingredient used in the industry, I can go over the main ones that cause the most problems. Parabens are chemicals commonly used as preservatives in many cosmetic products including makeup, moisturizers, hair care products and shaving creams or gels. These parabens, which include methylparaben, propylparaben, ethylparaben, and butylparaben can penetrate the skin and act like a very weak estrogen in the body. This can potentially turn on the growth hormone-receptor-positive for breast cancers. It's hard to find products without flashy, bright colors trying to steal our attention anymore. Is this simply an effective sales tactic or is there more than meets the eye when it comes to these provocative products? The answer is yes, in more ways than one.. 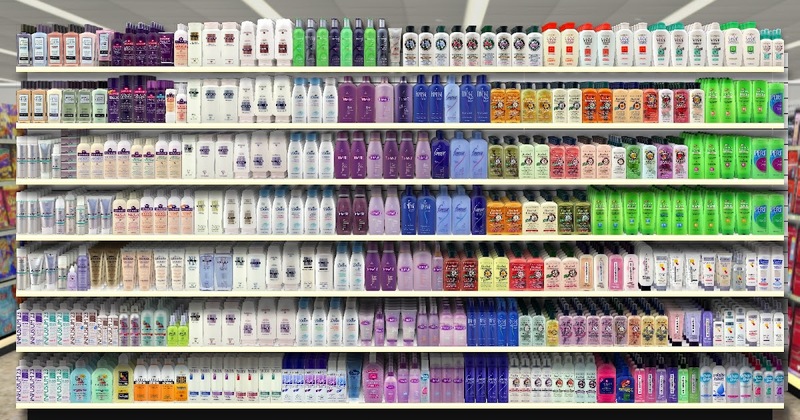 If you have ever picked up a bottle of shampoo or body wash, you might have seen FD&C or D&C on the label. If you are like me, that probably had you wondering what they are. These letters represent artificial colors. The "F" stands for food and the "D & C" represent drug and cosmetics. The letter combinations will proceed a number like D&C Red 27 or FD&C Blue 1. Synthetic colors like "D&C Red 27 or FD&C Blue 1" are derived from petroleum or coal tar sources. No wonder these synthetic colors are suspected of being a human carcinogen, skin irritant and linked to ADHD in children. Not only does European classification and labeling consider synthetic colors a carcinogen, the European Union has banned them all together. Now this next one is pretty shocking because it seems so harmless. It has to do with the term "Fragrance" and what it means. This term was actually created to protect a company's "Secret Formula" and is still used for secret ingredients today! Fragrance can be found in almost all personal care products such as perfume, cologne, shampoo, conditioner, body wash and moisturizers. Something to keep in mind as a consumer who could be putting on a concoction of chemicals that are harmful to your health. Don't just take my word for it, according to the Environmental Working Group (EWG) Skin Deep Database, fragrance mixes have been associated with allergies, dermatitis, respiratory distress and potential effects on the reproductive system. Phthalates are a group of chemicals used in hundreds of products to increase flexibility and softness of plastics. The main phthalates in cosmetics and personal care products are dibutyl phthalate in nail polish, diethyl phthalate in perfumes and lotions and dimethyl phthalate in hair spray. These chemicals are known to be endocrine disruptors and have been linked to increased risk of breast cancer and reproductive birth defects in males and females. What makes matters even worse is that this ingredient is not disclosed on every product it is in. It gets added to the fragrances, which are a major loophole in the law by using "Secret Formulas" that are not listed like I mentioned. Making this a possible ingredient in many deodorants, perfumes, colognes, hair sprays and moisturizers. These last chemicals, of many more I could cover, are surfactants and can be found in more than 90 percent of personal care and cleaning products. Sodium lauryl sulfate (SLS) and sodium laureth sulfate (SLES) are known to be skin, lung and eye irritants. One of the major concerns about SLS is the potential it has to interact and combine with other chemicals to form a carcinogen known as nitrosamines. These combinations can also lead to many other health issues such as kidney and respiratory damage. Now that you know about the dangerous ingredients in many personal care products, how do you find products that are safe? You can start out by looking at labels to avoid the known dangers you can see. But, to really avoid the hidden dangers in things like "Fragrance," you should buy products that have been certified by third parties like USDA Organic, NPA, NSF or Quality Assurance International. You can also find yourself better off by shopping at stores like Whole Foods or online stores like Thrive Market that have higher standards for the products they sell than your typical retailer. Shop smart, keep an eye on labels and support honest brands. Follow this and you will be on the right path to a healthier, happier body through natural personal care!